One of the more popular “Power Rangers” seasons was season two of “Mighty Morphin.” One of the biggest reasons was Lord Zed and the zords were just awesome looking. Of course, this was based on a Japanese sentai show. Shout! 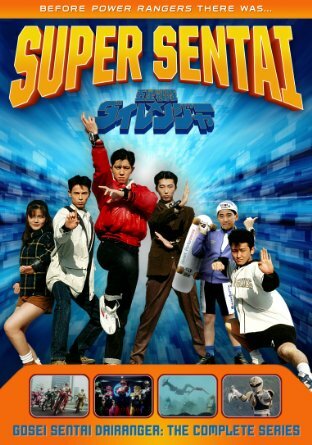 Factory, on the heels of releasing the complete “Kyōryū Sentai Zyuranger” on DVD, has released the complete “Gosei Sentai Dairanger.” Both sentai and “Power Rangers” fan should rejoice about this in more ways than one. 8,000 years ago, the Daos Empire flourished in relative peace. One day the Gorma tribe decided to attack and conquer the whole world, but was stopped by the Dai Tribe. Today, the Gorma have returned and now Kaku, one of the last remaining members of the Dai, has gathered five people with hi levels of Ch’i to fight against the Gorma. This is the plot many people think of when they hear “Power Rangers.” Kaku is Zordon despite being human and not a floating head in a tube. The difference here is that these rangers are not high school students. All of them are already working full-time jobs. Another difference is that unlike season one “Power Rangers” where the main villain from “Zyuranger” is in the show; there is no Lord Zed in this version (he was a Saban creation.) The Gorma look like a leather wearing biker gang. That does not mean they’re a joke. Each member has their own set of abilities that make them a threat. Also, the show is a lot darker in tone than season two “Power Rangers.” The monsters do some pretty terrifying things like kidnapping and attempted murder. In fact, some of the imagery may be a bit too much for some kids. That doesn’t mean this series has some silliness to it. One of the biggest that stand out is everything about Kou. Throughout the series, we see him grab Rin’s breasts. Also, he’s nine years old and is the Kiba (white) Ranger. The show got around to Kou’s height problem by having him grow into an adult when he transforms. As for the show itself, it’s one of the best Sentai shows out there. The rangers themselves have a lot of character to them and each actor brings a lot to them. They don’t come across as stock children’s show characters. These are real people with normal lives that happen to fight evil whenever it comes up. This is also one of the more serious sentai shows, but not too serious and not too silly. The production value is done well despite it being a low budget show. The fights look great, the giant robot battles are what every sentai fan wants and the special effects are decent. Of course, the low budget does rear its ugly head from time to time, namely whenever there’s something that supposed to be a TV screen or when a character is interacting with a giant monster. You can see the green screen. Sadly, Shout! Factory has not put any extras on the DVD. There are the original TV commercials that appear before episode one so that was nice. “Gosei Sentai Dairanger: The Complete Series” DVD is a great viewing for any American sentai fans and “Power Rangers” fans wanting to legally see the original series. It has a great story, characters, action and giant robots despite some of the typical silliness that comes with these shows.